North Korea (formally, the Democratic People's Republic of Korea or DPRK), has active and increasingly sophisticated nuclear weapons and ballistic missile programs, and is believed to possess chemical and biological weapons capabilities. North Korea unilaterally withdrew from the Treaty on the Non-Proliferation of Nuclear Weapons (NPT) in January 2003, is not a party to the Comprehensive Nuclear-Test-Ban Treaty (CTBT), and has conducted six increasingly sophisticated nuclear tests since 2006. The DPRK is not a party to the Chemical Weapons Convention (CWC), and is believed to possess a large chemical weapons program. Despite being a state party to the Biological and Toxin Weapons Convention (BTWC) and Geneva Protocol, evidence suggests North Korea may maintain an offensive biological weapons program. North Korea’s initiated its ballistic missile program in the late 1970s and early 1980s, when it acquired Soviet Scud-type missiles from Egypt and reverse-engineered them. In the early 1990’s, with assistance from Iran and several other countries, North Korea began producing Nodong medium-range ballistic missiles (MRBM). North Korea has developed and tested a number of new missiles since Kim Jong-un’s ascension to leadership in 2011, such as the Intermediate-Range Hwasong-12 and the extended range (ER) Scud. In addition to its land-based ballistic missiles, North Korea has successfully tested a submarine-launched ballistic missile, the Pukguksong-1. North Korea also has a Space Launch Vehicle, the Unha, which uses technologies closely related to its ballistic missiles. North Korea is not a member of the Missile Technology Control Regime (MTCR). 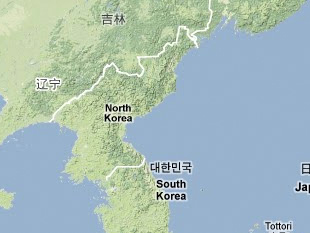 Visit the CNS/NTI North Korea Missile Test Database for a comprehensive visualization of all of North Korea’s missile tests since 1984. Visit the North Korean Ballistic Missile Models page to interact with 3D models of North Korea’s missiles. Gabriel Dominguez and Karl Dewey and Markus Schiller and Neil Gibson, “North Korea claims second ICBM test launch shows all of US is within range,” IHS Jane’s Defence Weekly, 21 July 2107, www.janes.com. “Large nuclear test in North Korea on 3 September 2017,” Norwegian Seismic Array, 3 September 2017, www.norsar.no. “Trump and North Korea Talks: South Korean Statement in Full,” BBC News, 9 March 2018, www.bbc.com. The White House, “Joint Statement of President Donald J. Trump of the United States of America and Chairman Kim Jong Un of the Democratic People’s Republic of Korea at the Singapore Summit,” 12 June 2018, www.whitehouse.gov. Jonathan Allen and F. Brinley Bruton, “North Korea Nuclear Summit Ends Abruptly With No Deal,” NBC News, 28 February 2019, www.nbcnews.com; Amy Held, “In Rare News Conference, North Korea Offers its Own Version of Summit Collapse,” National Public Radio, 28 February 2019, www.npr.org; “What to Make of the Hanoi Summit Collapse?” BBC News, 28 February 2019, www.bbc.com. “Application of Safeguards in the Democratic People’s Republic of Korea,” IAEA, 2 September 2011, www.iaea.org. “The DPRK’s Violation of its NPT Safeguards Agreement with the IAEA,” IAEA, www.iaea.org. “CIA estimates on North Korea’s nuclear program provided to Congress on 19 November 2002,” Federation of American Scientists, www.fas.org. Austin Ramzy and Emily Cochrane, “Road to Talks Between the U.S. and North Korea Has Been Bumpy,” The New York Times, 9 March 2018, www.nytimes.com. Jeffrey Lewis, “After the Trump-Kim Summit, U.S. and North Korea Appear as Far Apart as Ever,” NPR, 14 June 2018, www.npr.org. Secretary of State Mike Pompeo, “Remarks to Traveling Press,” Seoul, South Korea, 13 June 2018, www.state.gov. Ankit Panda, “North Korea May Already Be Annually Accruing Enough Fissile Material for 12 Nuclear Weapons,” The Diplomat, 9 August 2017, www.thediplomat.com. “Unclassified Report to Congress on the Acquisition of Technology Relating to Weapons of Mass Destruction and Advanced Conventional Weapons, Covering 1 January to 31 December 2011,” Federation of American Scientists, www.fas.org. Republic of Korea, Ministry of National Defense, "2012 Defense White Paper," 11 December 2012, p. 36, www.mnd.go.kr. Office of the Secretary of Defense, "Military and Security Developments Involving the Democratic People's Republic of Korea 2015," www.defense.gov. Organization for the Prohibition of Chemical Weapons, "Non-Member States," www.opcw.org. Joseph Bermudez Jr., "North Korea's Chemical Warfare Capabilities," 38 North, 11 October 2013, http://38north.org. "Strategic Weapon System, Korea, North," Jane's Sentinel Security Assessment, 5 July 2010. UN Human Rights Council, "Report of the Detailed Finds of the Commission of Inquiry on Human Rights in the Democratic People's Republic of Korea," A/HRC/25/CRP.1, p. 93, 7 February 2014, www.un.org. “Malaysian Police Say Kim Jong Nam Killed with VX Nerve Agent,” James Martin Center for Nonproliferation Studies, 24 February 2017, Nonproliferation.org. Michael Elleman, “The New Hwasong-15 ICBM: A Significant Improvement That May Be Ready as Early as 2018,” 38 North, 30 November 2017, www.38north.org. Joseph S. Bermudez Jr., “Occasional Paper No.2: A History of Ballistic Missile Development in the DPRK,” James Martin Center for Nonproliferation Studies, 1999, www.nonproliferation.org. “No Dong 1,” Center for Strategic and International Studies Missile Defense Project, www.missilethreat.csis.org. 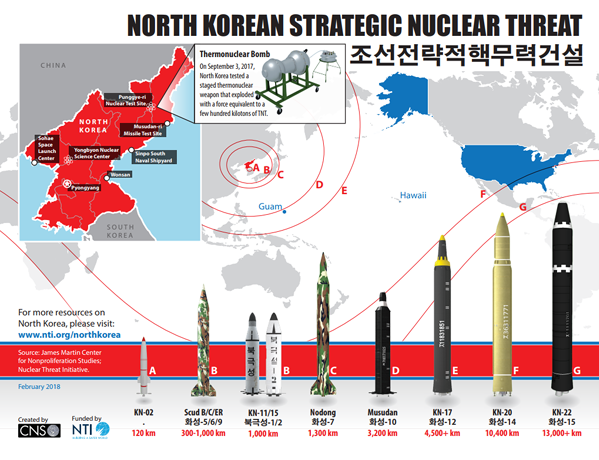 “The CNS North Korea Missile Database,” Nuclear Threat Initiative, www.nti.org. Ju-min Park and Jack Kim, “North Korea fires submarine-launched ballistic missile towards Japan,” Reuters, 23 August 2016, www.reuters.com.